Posted on April 26, 2011	by Lou Murray, Ph.D.
As you can see, I haven’t gotten back to blogging regularly. Getting the new community garden up and running took an inordinate amount of time. That plus working on my own garden at home seems to have eaten up all my spare time. I’ve been taking photos, but finding time to process them has eluded me. So without playing catch-up, here is what my home garden looks like this week. 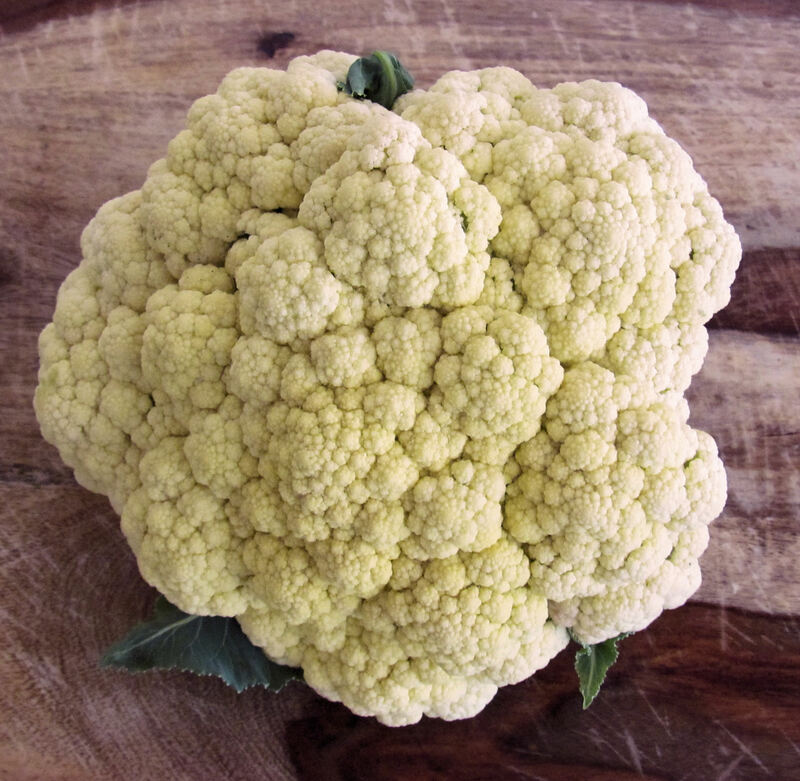 The first head of cauliflower this season was perfect, weighing in at 1.5 lbs. Henrietta and Chicken Little are both laying again. But sadly, Henny Penny passed away last week of unknown causes. 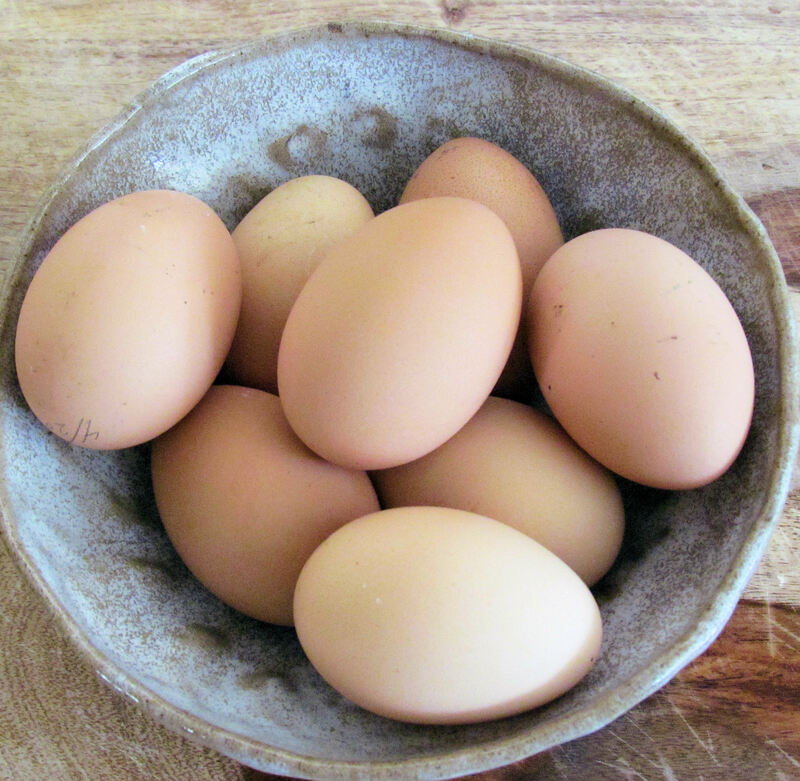 She hadn't laid an egg since last September, so maybe it was old age. 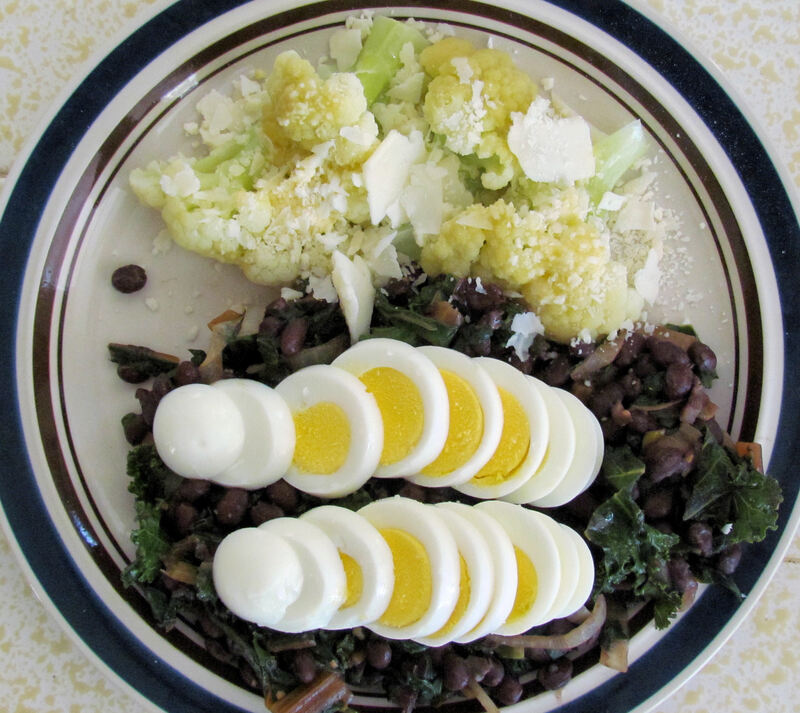 One of our lunches was steamed cauliflower with shaved parmesan cheese, plus black beans and greens with garlic and onion, topped with sliced boiled eggs. 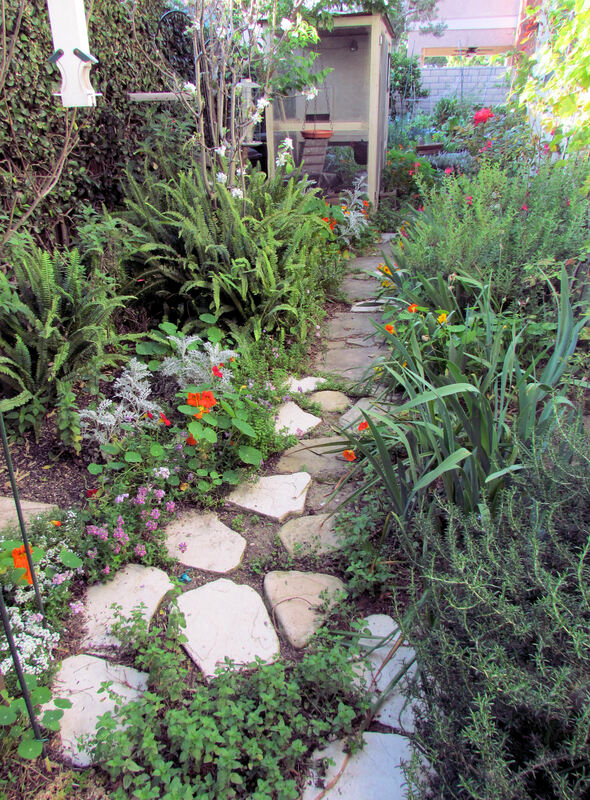 The pathway in back is lined with irises, roses, grapes, ferns, and fruit trees (peach, plum, and three apple trees). This is the first of my new bearded irises to bloom, a variety called Clarence. 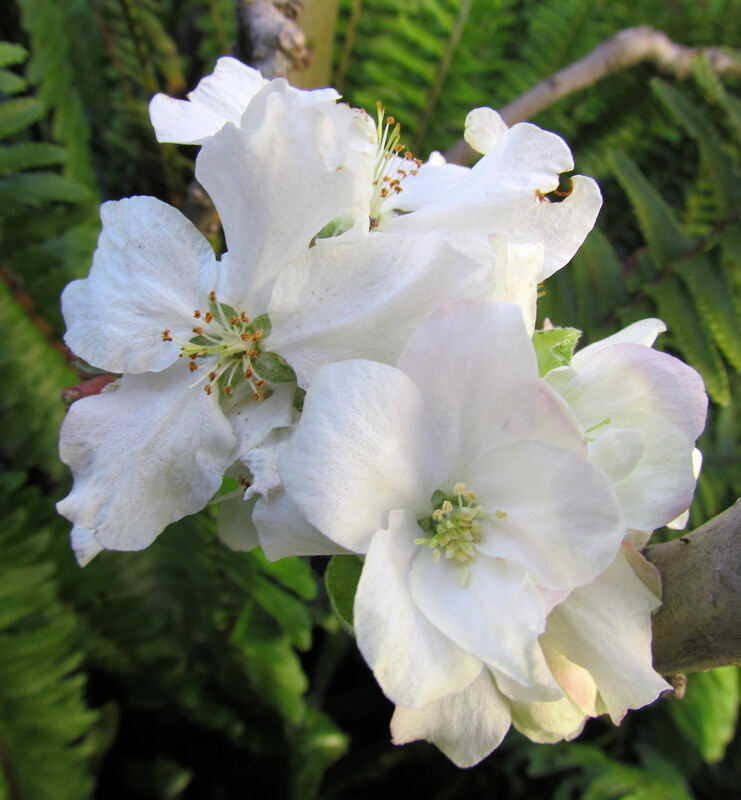 My dwarf Granny Smith apple tree is in full bloom, but the Fuji and Gala are still dormant, as are the Asian pear trees. 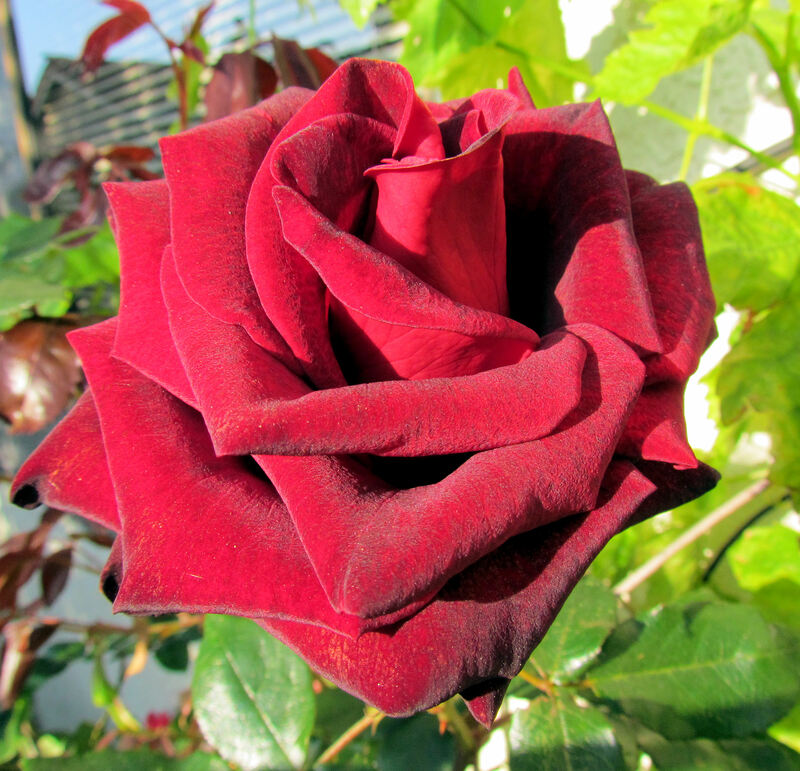 My roses are in bloom, at least some of them. This one is my favorite. It's either Mr. Lincoln or Chrysler Imperial. My two veggie gardens in front are The Garden of Infinite Neglect and The Garden of Perpetual Responsibility. I've decided to name my raised beds in back "The Farm." They produce most of the food that we grow. The herb garden is in front, and our new block wall is in back. 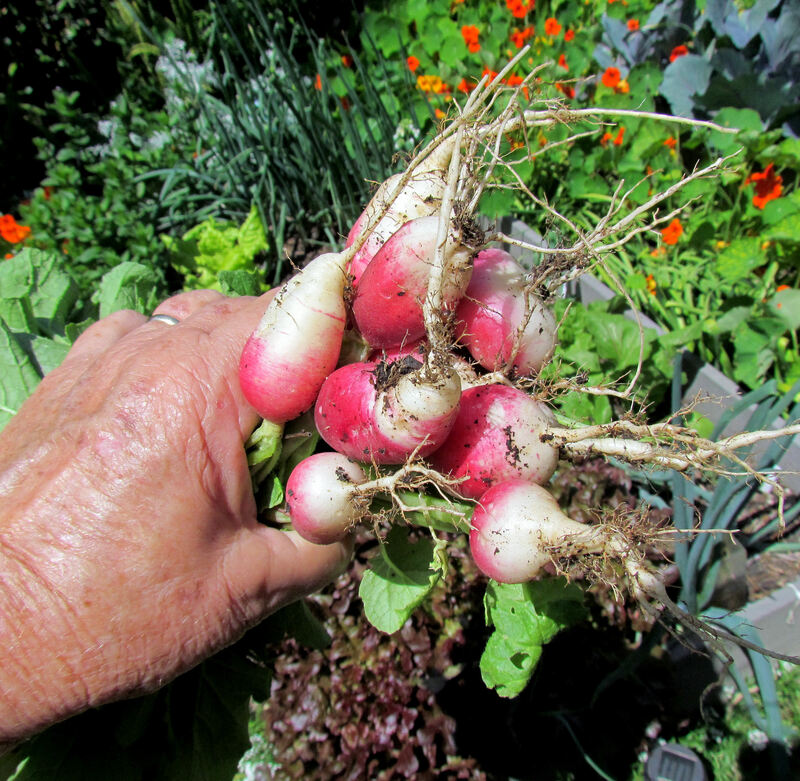 This is about half of my radish harvest so far this year. These are French Breakfast and Dutch Redheads. 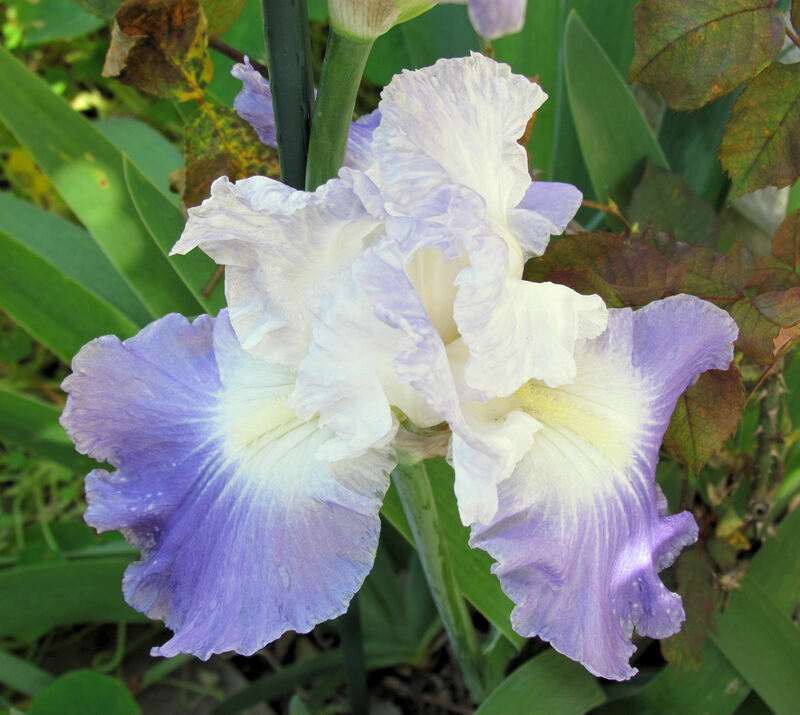 Here's a better shot of the Clarence iris. Look what I found! An avocado that I missed. They don't ripen until picked. I'm thinking that this one will be good for Cinco de Mayo. 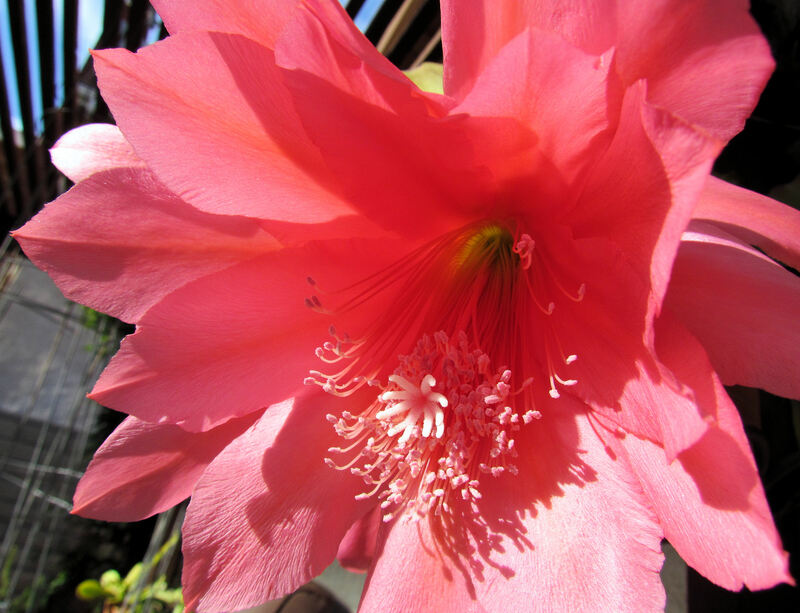 My salmon orchid cactus are in bloom now, with the red ones about to open. That pretty much does it for what the backyard looks like in late April. On to this week’s harvest. If you had a harvest, visit Daphne’s Dandelions to post the results. Brenda, I’ve had similar luck with growing cauliflower from seed, but managed to get some cheddar cauliflower last year. My purple cauliflower didn’t sprout. This year I grew Candid Charm from transplants and am having great luck. I’m so sorry to read about Henny Penny. Sometimes it’s so difficult figuring out what ails a chicken, as they’re such stoic creatures. Glad though that the rest of your girls are doing well. Your cauliflower looks fabulous! I love cauliflower, but sadly Mr. CV does not, so I don’t tend to grow it here. 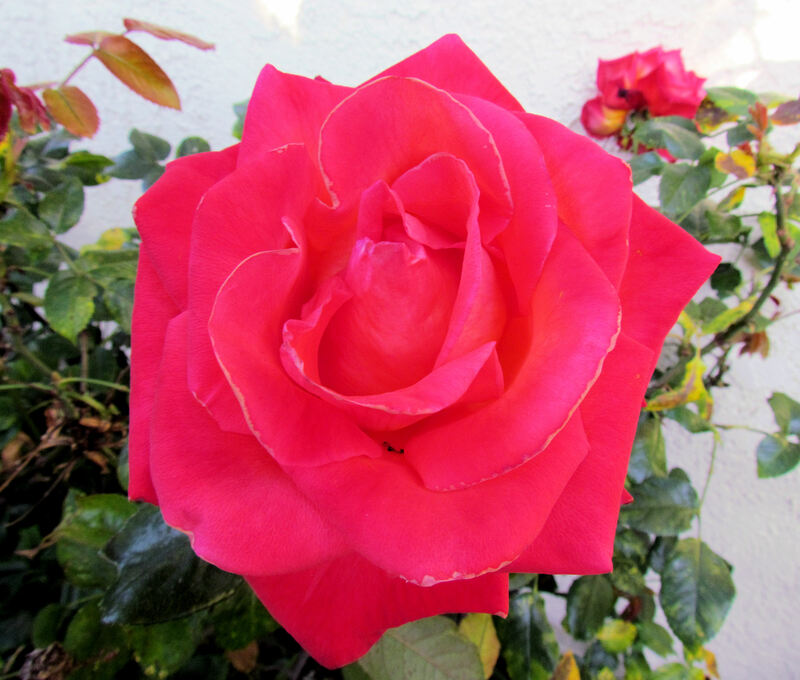 I can’t believe how much you have blooming in your garden! Looks like your nasturtiums are a blaze with color. Ours aren’t that far along yet! Clare, the nasturtiums have taken over the back yard. I can hardly walk through them. They have peaked though and now the back is opening up a bit. You got a very nice harvest. And I love your iris. I was looking for some dwarf iris today. They tend to live through anything and I have a spot for a plant like that. 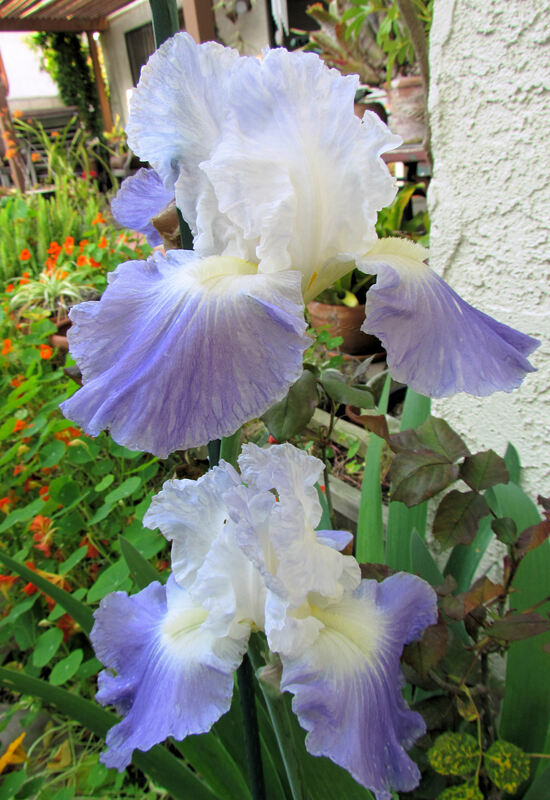 Daphne, I have a second new iris in bloom now. Can’t remember its name but I’ll check when (if) I get around to photographing it. 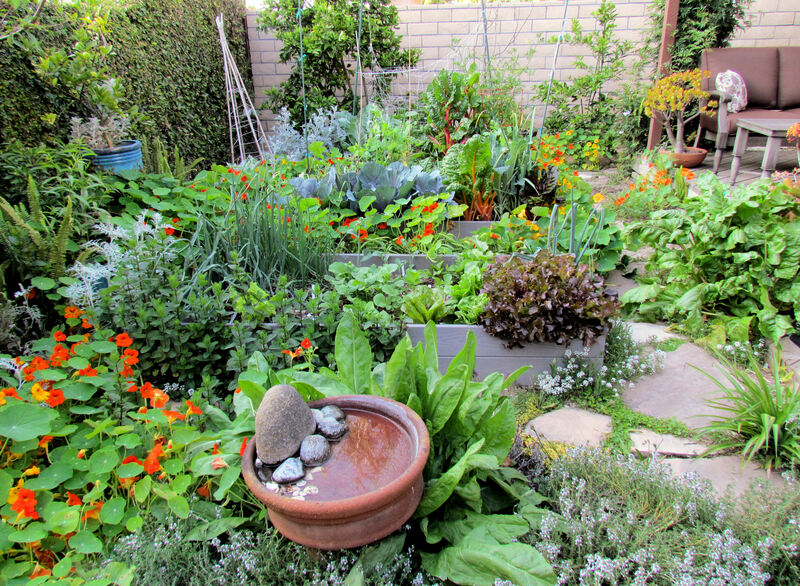 Where is the community garden located in Huntington Beach. I would love to visit it sometime. Dennis, the community garden is at the end of Atlanta Avenue, east of Brookhurst, at the dead end under the power lines. Park your car on the right on Atlanta and walk through the chain link fence gates. Walk a short distance and the gardens are on the right. If someone is in the garden, the gate will be unlocked. 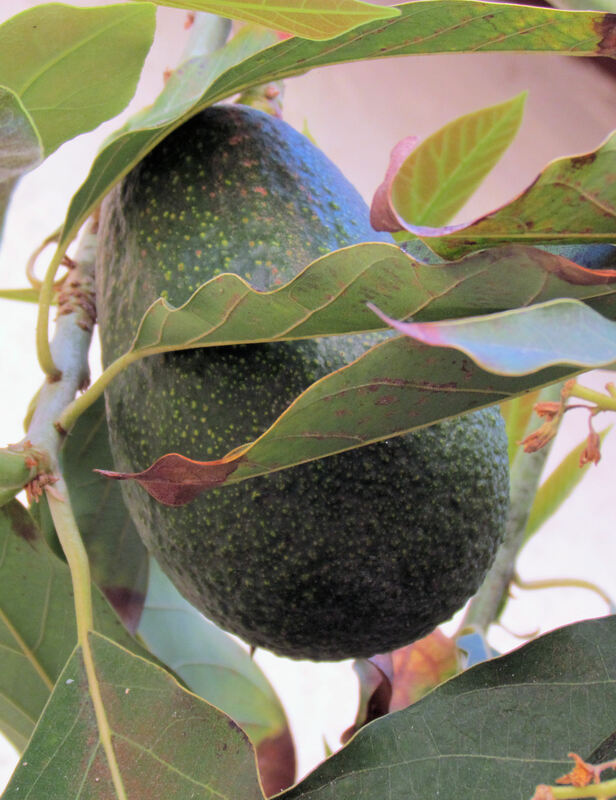 Enjoy your avacodo on Cinco de Mayo! Barbie, I didn’t get around to picking the avocado and yesterday was Cinco de Mayo. We went out to eat. I had a fabulous Tostada del Mar with crab, shrimp and octopus.